Recently Professor Ronald McKinnon of Stanford published a book with a lovely title: “The unloved dollar standard”. Professor McKinnon´s main thesis is that to better stabilize the USA and world economies the unloved dollar standard has to be rehabilitated by ‘internationalizing’ American monetary and financial policies, where by ‘internationalizing’ American monetary and financial policies he means stabilizing the value of the dollar in the foreign exchange markets. The charts below graph the dollar against a basket of major currencies through time since the end of the Bretton Woods era of fixed exchange rates. It´s really a story of “up & down and merrily fluctuating around”. It is said that NGDI is a more accurate measure than NGDP. Maybe the income data is easier to record? Anyway, they make up the two sides of the national income accounts. The product (NGDP) side measures production and sales. The income (NGDI) side measures the distribution of the proceeds from sales. In a “perfect world” they should be identical. But we live in an “imperfect world”, so there are discrepancies. Despite the (short term) “discrepancies”, over time they should give out the same information, i.e. they shouldn´t persistently or systematically diverge. So let´s visually examine the two series over a long span of time. For no particular reason I chose to start the comparison in 1987 (start of the “Great Moderation”, a period in which the Fed managed to closely target the level path of NGDP). The chart shows that NGDI & NGDP were almost exactly the same at the end points. Nevertheless there are periods in which they diverge, as in 2004-06, for example. 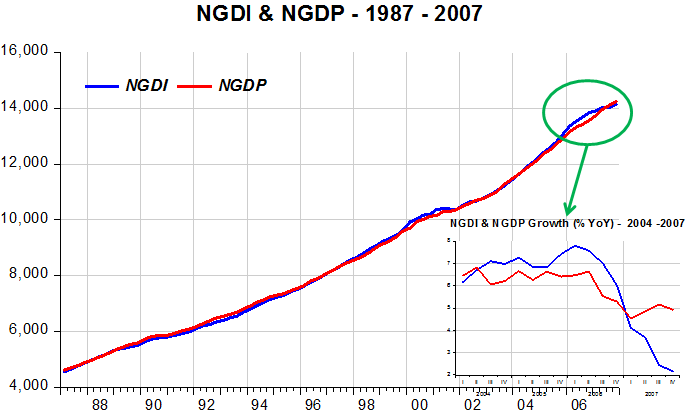 The small chart within shows that NGDI was above (growing more) than NGDP in 2004-06. To “adjust” NGDI growth fell well below NGDP growth in 2007. This was an instance of “catch-down”. (Note: more econometric work is needed to ascertain which of the two – NGDI or NGDP – does the “adjustment.” From “eyeballing” the charts and others that I´ve fiddled with, I would guess, and it´s only a guess, that NGDI does the “adjustment”, i.e. grows more or less than NGDP to “bring them together”). 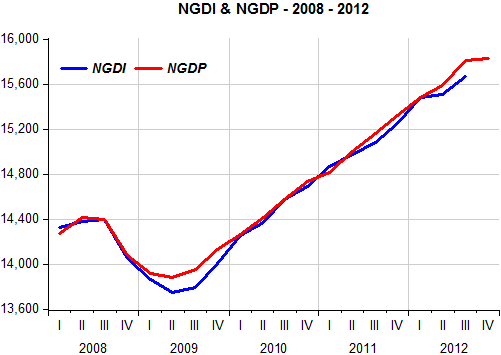 The next chart shows NGDI & NGDP since the start of the Great Recession. Note that at the start NGDI fell more than NGDP, which was followed by a period of higher NGDI growth to “catch-up”. Lately, NGDP has been above (grown more) than NGDI. Scott has said that preliminary numbers from the BEA indicate that NGDI has grown close to 4% in Q4 2012. This would be consistent with the conjecture that NGDI does the “adjustment”. But it doesn´t imply, as Scott writes, that “NGDP (probably) up around 4% in 2012 Q4”. The title, obviously a “tribute” to Hitchcock, well captures both Bernanke´s “strenght & weakness.” I reproduce a chart that I put up earlier because it clearly shows that. The Morgan Stanley economist said the Fed is “falling short” in its efforts to provide a clear stated monetary policy regime, and he blamed it in part on the difficulty of getting FOMC members to all agree on the best way to proceed. Krugman and his aide-de-champ DeLong are NEVER wrong. Until somebody proves the contrary! So although the headlines may sound scary, I do not think the GDP report changes the underlying fundamental picture. We knew that fiscal contraction, developments in Europe, and Hurricane Sandy would exert a drag on the economy, and they did. We knew that housing would help a little, and it has. The reasonable expectation is still to anticipate positive but below-normal growth for the first half of 2013, and hopefully a better picture for the second half. Or if you don’t want to take my word for it, check out Calculated Risk, Free Exchange, Capital Spectator, and the economists surveyed by Sarah Portlock, whose assessments are similar to my own. Note: Groupthink is a psychological phenomenon that occurs within a group of people, in which the desire for harmony or conformity in the group results in an incorrect or deviant decision-making outcome. Group members try to minimize conflict and reach a consensus decision without critical evaluation of alternative ideas or viewpoints, and by isolating themselves from outside influences. Loyalty to the group requires individuals to avoid raising controversial issues or alternative solutions, and there is loss of individual creativity, uniqueness and independent thinking. Austrian Radicalism: Deflation is always and everywhere…GOOD! Contrary to the popular view, price deflation as a rule is always good news for the economy. When prices are falling in response to the expansion of real wealth, this means that people’s living standards are rising. When prices are falling as a result of the burst of the financial bubble, it is also good news for the economy, for it indicates that the impoverishment of wealth producers was arrested. The latest proposed Japanese policy to raise the pace of the monetary pumping in order to counter deflation amounts to furthering the economic impoverishment of wealth producers, thereby delaying any meaningful economic recovery from taking place. In Q3 the good (3.5% annualized growth) reflected the positive contribution of personal consumption expenditure which was reinforced by inventory investment. In Q4 the 0.1% contraction (annual rate) was due to inventory investment, government spending (defense) and exports offsetting the positive contribution of the consumer and housing and equipment investments. Market Monetarists eschew the “components” analysis preferring to view the “aggregate”, in particular aggregate nominal spending, or NGDP. And how has that behaved before and after Bernanke “took the Fed´s helm”? 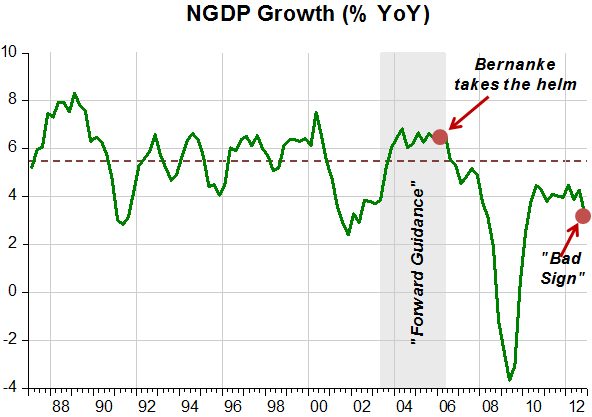 Note the period named “forward guidance”, during which NGDP growth was systematically above trend growth (5.5%). But this was necessary to bring the level of spending back to trend after it had grown way below trend in 2001-03. 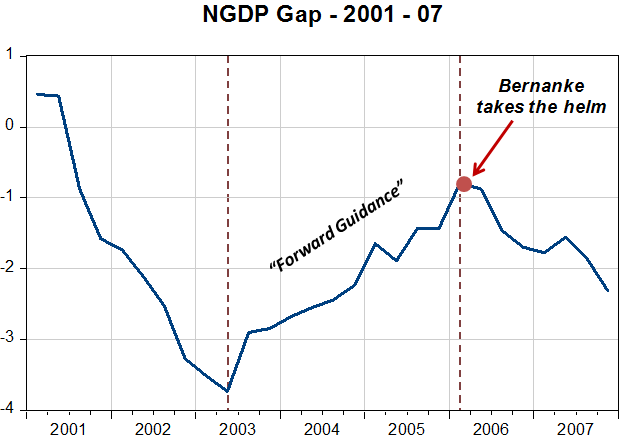 Note also that soon after taking the helm Bernanke lets spending growth dip below trend again. And then, there´s the big plunge after mid-2008. Spending never grew strongly enough to get it back towards trend and now we learn that it only grew by a measly 0.45% (annual rate) in the last quarter of 2012! The next two charts show the “NGDP gap” (relative to the “Great Moderation” trend). It is clear, in the first of the two charts, that the “forward guidance” period was successful in turning the falling NGDP growth trend around, taking spending back towards the trend. Again, we see that Bernanke allowed it to drop back. The second chart shows that when Lehman folded NGDP had already fallen significantly (8%) below trend, a fact that surely goes a long way in “explaining” the gravity of the financial crisis. It also shows that the QE programs were only sufficient to break the speed at which NGDP was falling below trend. 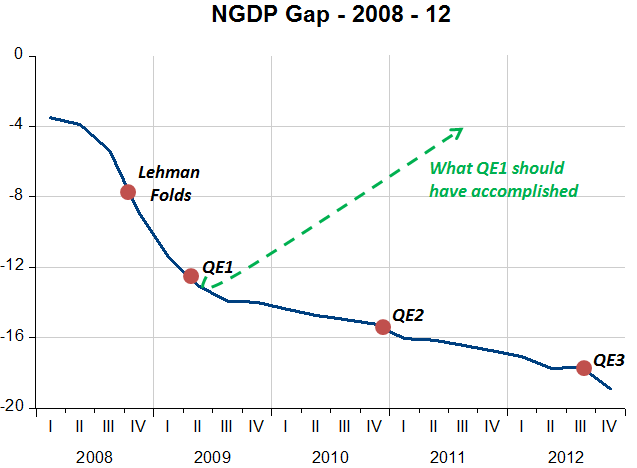 I draw a line showing what a successful QE should have accomplished. And what was going on regarding inflation during the whole time? Unfortunately Bernanke´s FOMC got all fussy about the possibility that inflation could become a problem! And we´re still experiencing the aftereffects of that “fussiness”, with the latest indication being that the situation may still deteriorate further. The Fed ratcheted up purchases of mortgage-backed and U.S. Treasury securities, and now they say more large-scale purchases are coming. They kept extending the near-zero federal funds rate and now say that rate will remain in place for at least several more years. And yet—unlike its actions taken during the panic—the Fed’s policies have been accompanied by disappointing outcomes. While the Fed points to external causes, it ignores the possibility that its own policy has been a factor. Research presented at the annual meeting of the American Economic Association this month by Eric Swanson and John Williams of the San Francisco Fed is consistent with this view of credit markets. It shows that during periods of forward guidance, the long-term interest rate does not adjust to events that shift supply or demand as it does in normal periods. Hum! Is that right? 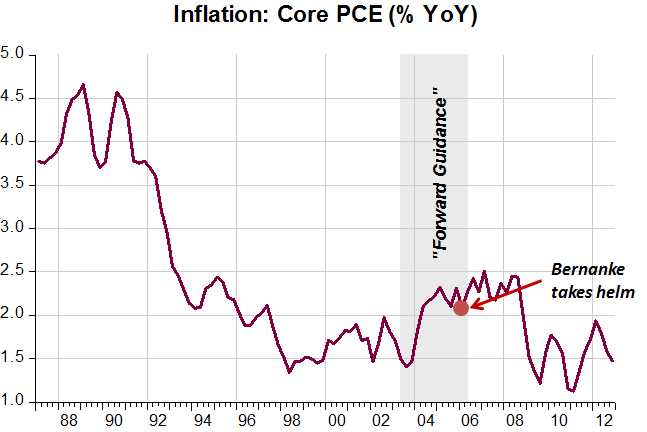 In 2003-04 the Fed also provided “forward guidance”. 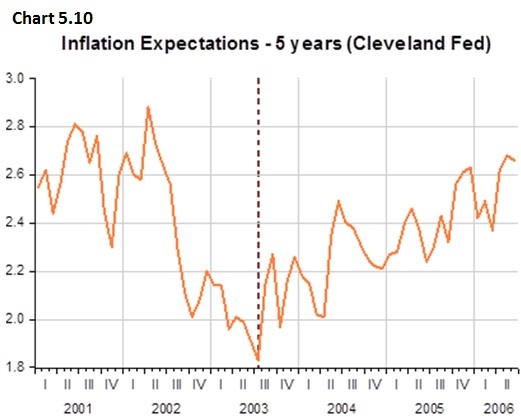 From early 2001 to mid-2003 the economy was in the ‘doldrums’: Nominal and real growth were falling, unemployment was on the rise, long term rates and the stock market were going down and so were inflation and inflation expectations. The Fed felt there was a risk the economy would tip into deflation mode! After trying to reverse the process with speeches about what could be done, without much success, the Fed embarked, in mid-2003, on providing “forward guidance”. The August 2003 FOMC meeting made it clear with the statement: “the FF rate will remain low (1%) for an extended period”. Later, in the March and May 2004 FOMC meeting the “forward guidance” was changed to “policy accommodation can be removed at a pace that is likely to be measured”. 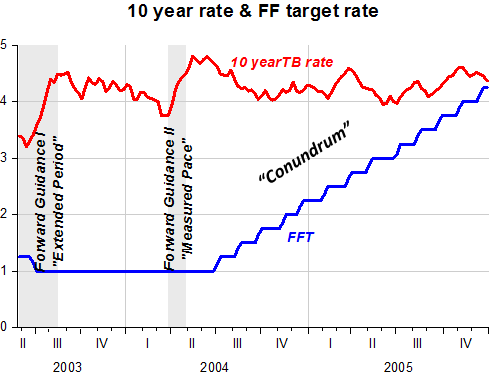 The chart shows that the build-up to “forward guidance” in the May-August 2003 FOMC meetings changed the course of long term rates. Long term rates adjusted again when “forward guidance” was ‘revised’ in March-May 2004. What followed was “Greenspan´s Conundrum”, the fact that rising short rates did not raise long rates. But we now know those adjustments had already happened! In our book, Benjamin Cole and I present the following charts. Taken together we believe they provide compelling indication that “forward guidance” worked; with all the relevant variables changing direction at the moment ”forward guidance” was implemented. Over the past four years what we´ve had is a series of “on” and off” decisions by the Fed that haven´t helped. More recently “forward guidance” has been made more explicit, but as implied by Taylor´s article, it has not been very helpful either. I wonder what would happen if after a FOMC meeting we learn that the Fed decided to adopt an NGDP level target. Britmouse did a post that describes Scott Sumner´s “game of musical chairs” view of business cycles. I thought it interesting to see how it compares to the US situation. The first chart shows US W/NGDP, where W is the average hourly earnings of nonsupervisory production workers. When the crash hit in mid-2008 it spikes. Wages are sticky so unemployment rises (i,e not enough chairs left for all workers to sit). Unemployment (both the ‘regular’ and the U6 (considers those marginally attached and ‘involuntary’ part timers) measures) is graphed next. 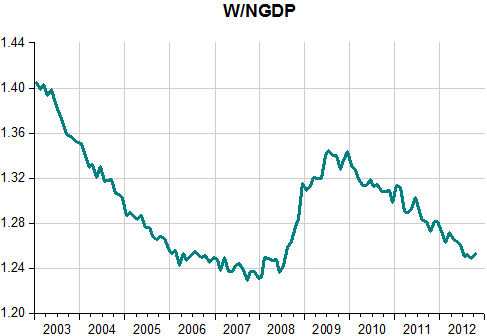 Contrary to what´s happened in the UK, in the US the W/NGDP ratio has come back down. That explains the fall in unemployment. 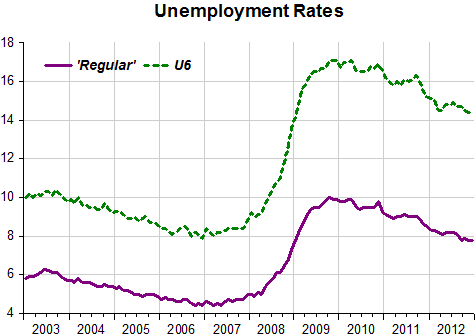 But unemployment should have come down much more given the fall in W/NGDP towards levels that prevailed before the crisis. And that is very likely due to the NGDP gap that has remained wide even if the ‘new’ trend level is somewhat lower than the previous one. 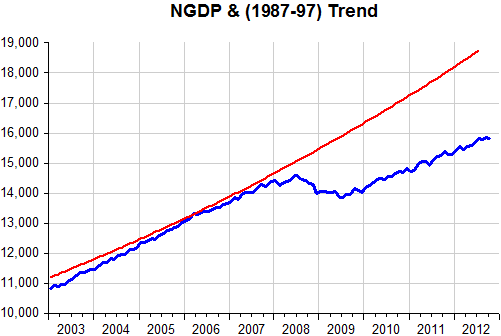 Details to note: From the last chart we see that between 2003 and early 2006 NGDP is ‘climbing’ back to trend. Therefore, NGDP growth is higher than trend growth, implying that the W/NGDP ratio is falling and so is unemployment. 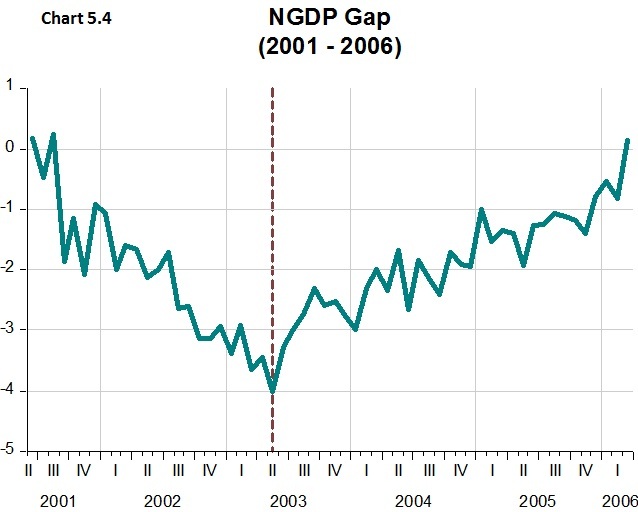 In 2006-07, NGDP grows close to trend growth. Unemployment ‘stabilizes’ and so does W/NGDP. Then, the ‘tsunami’ arrived. Some say it was due to the bursting of the house bubble, some say it was the result of the financial crisis that ensued (with Lehman the trigger), with all these things ‘commingling’ with the high level of private debt that prevailed. MM´s point the finger at the Fed and say “you did it”! Despite these many drawbacks, DSGE models got one big thing right: they could explain “stagflation” by pointing to people’s changing expectations. At first, a sudden unanticipated spurt of inflation could lead to rapid economic growth. Over time, however, people would come to believe that this rate of inflation would be the new normal. Real interest rates, wages, and debt burdens would eventually adjust to their old levels. The gains in employment would be temporary—eventually it would settle at its “natural rate.” Moreover, savers and investors would become increasingly wary of the government’s willingness to induce inflation and increase the risk premium they demand on long-duration assets. The government could try to make prices increase faster and faster, hoping that policy would outrun people’s rapidly-adjusting expectations, but the consequences would likely be dire. That is exactly what Friedman said (and explained) in 1967, almost two decades before the first seed of what would over time become known as DSGE Models was planted in 1982 by Kydland and Prescott!